This weekend my wife, our kids and I visited Rome. For them their first visit to the eternal city, for me the second real visit. I already visited Rome in May 1989 with the entire fifth grade of the RK Gymnasium Rolduc and for work I've been there once or twice, although those were typical business trips, from the plane to the meeting and back into the plane. 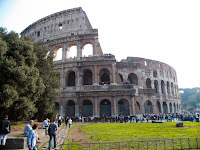 Ever since her classmate held a presentation about Rome my daughter Giulia (the oldest of 9 years old) wanted to visit Rome and the Colosseum in particular. 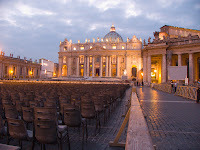 So Friday morning (October 15th) we flew with EasyJet from Milan-Malpensa (MXP) to Rome-Fiumicino (FCO) where our B&B arranged for a taxi to pick us up at the Airport and drive us to our B&B near Vatican city. After we dropped our luggage in our spacious and nice room of B&B Sweet Vatican we walked to the Ottaviano metro station, just 50 meters from our B&B. From there it could've been a 15min drive to the Colosseum, changing lines at Termini if it wasn't for an illogical deviation to get from Line A to B at Termini station. Apparently the Termini station is being renewed but the deviation is ridiculously long: climbing stairs, walking through small hideous tunnels, exiting the metro station, walking through the train station, enter the metro station again, descend some stairs, walk through tunnels again and finally arrive on the right platform. In the evening the trip back in opposite direction was just one stair down, around the corner and there we were.... they are crazy these Romans! Anyway, after a 15min metro trip and a 15min walk through the metro building we arrived at Colosseo Station. And right outside it was: the Colosseum Giulia was longing to see for over a year. We were immediately caught prisoners by a crazy Roman with sword and everything who wanted to throw us for the lions if we did not take a picture with him, and of course wanted to get paid for this service. 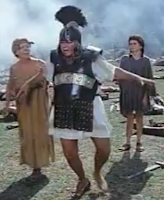 There are quite a few of these leftovers from the once so mighty Roman Empire, some of them in good shape, some of them reminded me of Fantozzi, an Italian slapstick actor (see photo on the left). But Rome is overloaded with tourists, even in October, and if they are photographed over 25 times a day they might make a better living then the average Roman craftsman.And of course we donated him as well. Before visiting the Colosseum we needed to lunch though, it was already past noon and the brioches of that morning were already digisted. So we walked into the smaller car-free streets not too far from the Colosseum where we found some nice looking restaurants with interesting menus. 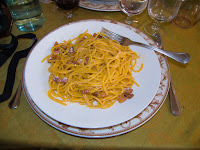 We choose Gli Angeletti; after a small antipasto with a selection of Salami and Bruschette al Pomodoro we all had a pasta. The original Roman Spaghetti Carbonara was really fantastic, I won't say it was the best ever, but it certainly got close. Having our stomachs filled we went back to the Colosseum where we wandered around for some time. Meanwhile I explained to the girls the fascinating and sometimes horrific history I recalled from History- and Latin classes in the past. But also from Asterix & Obelix and films like Spartacus and the Gladiator to be honest. After having walked around in and outside the Colosseum Maddy could use some rest. Her leg, still recovering from an accident and operation, was not enjoying all those Roman steps and ancient roads. I wonder by the way how these Romans could ever drive on their roads with wooden cars and wooden wheels without suspensions... The chiropractor must have had enough to do. The trip back to our B&B went a lot faster. Our legs (and eyes) got some rest before we went back into Rome, but not without passing the Saint Peter, it was getting dark and the church is so beautifully lighted that we shot some nice pics out there. From here we took the bus into the centre, to arrive near Piazza Navona, one of world's most beautiful squares. Just walking around, absorbing the atmosphere, enjoying the liveliness of a city always gives me a pretty damn good feeling, I could do that all day and night long. Of course dining on the Piazza Navona is something for the Japanese, so we strolled into the streets one or two blocks away from the square and found a typical bar to have an Aperol-Spritz (and some bites for free): Bar del Fico. Next stop Ristorante La Scaletta degli Artisti, friendly owner and waitress, fair prices for decent food (nothing spectacular though).